Right, that is all from me so I'll point you in the direction of our main Saturday football live coverage, where you can get all the reaction. All over and Stoke are well beaten. Arsenal could arguably have had more but for Jack Butland. Olivier Giroud falls inside the area under a challenge. Foul? Referee thinks not, and replays show it is the correct decision, with Giroud just losing his footing. Stoke are going through the motions now, with this game beyond them. The Potters are yet to register a win in this season, and it is their worst start to a season after five games since 2010. Arsenal are not done yet as Jack Butland beats away a Laurent Koscielny effort. "If Arsenal fans aren't happy today I don't know what more their team can do. It's been some performance, they've been brilliant today. OK, they haven't put too many in the back of the net but they created so many chances." Game, set and match. Olivier Giroud nods in from Santi Cazorla's free-kick and that goal will leave Arsene Wenger with a big, beaming smile on his face. Both his main strikers getting the goals today. A double change for Arsenal as Alex Oxlade-Chamberlain and Mikel Arteta come on for final few minutes, Mesut Ozil and Alexis Sanchez the two to go off. Jeremiah Kariuki: Giroud announces his arrival with a big miss. Daramola: How did he miss that?? Tweet using #bbcfootball, send a text to 81111 or post to the BBC Sport Facebook page. Phil Bardsley dives in on Alexis Sanchez, taking out his legs and missing the ball. Yellow card. Stoke are tiring as we enter the final 10 minutes and Santi Cazorla almost exploits some space, but curls a shot wide. Olivier Giroud, with his first touch, steers the ball wide from eight yards out after some shocking defending by Stoke. Should have been 2-0 but then Arsenal should have been out of sight ages ago. Changes for both sides as Mame Diouf, who has had a very, very quiet game, is replaced by Bojan. For Arsenal, goalscorer Theo Walcott goes off to big applause and on comes Olivier Giroud. The France international was booed while on international duty after missing a number of chances, what impact will that have had on his confidence? A bit of off the ball bother as Stoke break. As the visitors attack, Marko Arnautovic tangles with Gabriel, before the former tumbles to the floor as the two run towards the Arsenal area. Arnautovic is fuming with Gabriel. Another Arsenal attack as this time good work by Santi Cazorla and Mesut Ozil unlocks the Stoke defence, allowing the latter a clear sight of goal. He tries to poke the ball in at the near post, but Jack Butland denies him. Moments later, Butland saves from Theo Walcott as the Arsenal forward springs the offside trap. Theo Walcott diverts a cross towards goal but it is too near Jack Butland and lacks power. That shot, I believe, was Arsenal's first shot on target since Walcott's opener. Arsenal are back on the attack as Mesut Ozil's cross is flicked behind for a corner, the hosts' 10th of the game. Once again, though, it is wasted as Stoke clear. "It was a good finish from Theo Walcott for the goal but I still have doubts about him playing as a striker. He missed two big opportunities before that. For one of them, from six yards out he couldn't get his feet right and smashed the ball over the bar. "I just think he'd get just as many goals as he does playing on the right wing." Stoke boss Mark Hughes blinks first and makes the game's first change as Stephen Ireland comes on for Joselu. Arsenal fans' excitement builds as a lovely, flowing move sees Alexis Sanchez play a pass to Mesut Ozil, who in turn frees Aaron Ramsey wide right but the midfielder leans back too much as he shapes to shoot and fires high and wide. Arsenal are deservedly ahead, but they are still not quite clinical enough in the final third. Arsenal have picked up where they had left off as they search for a second. Nacho Monreal is allowed to run unchallenged down the left, giving him the time and space to try and pick out Theo Walcott at the near post, but a Stoke defender sticks a leg out to put the ball behind. Can Arsenal put this game to bed with further goals in the coming 45 minutes? Original Narrator: Is it fair to young Oxlade-Chamberlain to be left on bench just to accommodate a place for Ramsey in the team? Huge talent frustrated. As it stands, Arsenal are up to third while Stoke are 18th. Look at Chelsea down there, too. Arsenal only lead 1-0 despite enjoying 72% of possession in the first half, and their heatmap (left) shows how they have seen lots of the ball all over the pitch. Stoke, in contrast, still have not really got out of their half as can be seen by their heatmap on the right, although Marko Arnautovic is at least giving them something of an outlet down their left wing. "Arsenal lead through Theo Walcott's goal, but Jack Butland has largely kept Arsenal at bay and the Gunners are always vulnerable at 1-0." Give Theo Walcott a ball to chase and not too much time to think about it, brilliant. Give him more time on the ball to fashion a move, though, and he's not so good. The Gunners build another attack as Alexis Sanchez charges forward, he plays the ball wide to Santi Cazorla, who then feeds a low pass to Walcott inside the area. The forward tries to flick the ball round his marker and chase, but fails to do either. Faddi S: What a pass by Ozil for Walcott's goal. Vision. In graphical form, Arsenal's goal does not look like much - anyone can play a long ball forward, right? In reality, it was a thing of beauty. Mesut Ozil played the precision pass, Theo Walcott supplied the simple finish and the Gunners take the lead. Mesut Ozil is the first man in the book this afternoon as his attempts to regain possession are deemed a little too aggressive. That goal, by the way, is the first Arsenal fans have been able to celebrate at home this season. "That is the type of goal Theo Walcott scores from the right wing, when he's running on to the ball cutting inside from deep. That isn't a problem for him. It's when he's playing around the box that the problems come." Arsenal, though, cannot afford to take it easy as Stoke almost respond with their first real attack of the game, Joselu fizzing a low shot through a crowd but straight at Petr Cech. "A wonderful ball from Mesut Ozil and Theo Walcott's dangerous when he can run into the space behind a defence. And it was an excellent, composed finish." Brilliant from Arsenal and fully deserved! Francis Coquelin wins the ball deep inside his own half, quickly passes to Mesut Ozil, who picks a sublime pass for Theo Walcott to chase and he finishes confidently. Who says Walcott is not an out and out striker? Can the Gunners make possession pay? The Gunners continue to dominate possession and continue to press. Still no way through for them yet though. Next to sting the hands of Jack Butland is Santi Cazorla with a fierce drive from inside the area. Jack Butland is definitely earning his coin today as Laurent Koscielny is allowed to roam forward unchecked. With no opposition shirt around him, the defender decides to have a pop from 35 yards and only a brilliant save by Butland denies him. "Mark Hughes won't be happy with the performance of Stoke and the way the match is panning out, though he'd take 0-0 as the result as his team are just holding on. "Arsenal should be two, three, even four ahead at this point." "Arsenal are off to flyer. Alexis Sanchez is phenomenal. He's really got the bit between his teeth today." After that brief foray into nosebleed territory for Stoke, Arsenal are back on the offensive as Francis Coquelin arrows a ball into the area, trying to pick out Theo Walcott, but the pass has too much power and goes beyond the forward. They have spent the opening quarter-of-an-hour defending but Stoke have a chance now as they win a free-kick some 30 yards from goal. Xherdan Shaqiri takes it, floating the ball into the middle of the box but Petr Cech strides out confidently to punch the ball away. The game has mostly been played in Stoke's half so far - Arsenal's heat-map on the left shows how they have dominated play thanks to their 73% possession, while Stoke (on the right) have barely seen the ball and have hardly made it to the other side of the half-way line. Now Theo Walcott puts on the afterburners to lead a break. He cuts inside Geoff Cameron but his shot is straight down Jack Butland's throat. How is this still goalless? Alexis Sanchez is everywhere at the moment and he sees a goal-bound shot blocked after some good work by Mesut Ozil opens up the chance inside the area. My word! Arsenal denied again by the woodwork as this time Alexis Sanchez's crisp, low strike skims across the surface of the pitch and hits the bottom of the right upright. Arsene Wenger scratches his brow in frustration, but Stoke are riding their luck at the moment. Another chance for Arsenal as Alexis Sanchez curls a free-kick over the wall and towards the far post, but Jack Butland gets across to push the ball behind for a corner. The Gunners are certainly keeping Butland on his toes with this fine start. Good from Arsenal! Santi Cazorla floats the ball into the middle of the box and Alexis Sanchez rises to head goalwards but Jack Butland does superbly to push the ball on to the post. Theo Walcott then skews a shot wide from the rebound. Typically patient passing from Arsenal in the very early stages as they test out the Stoke defence. Aaron Ramsey clips a pass out wide to Nacho Monreal, but his ball into the box is a bad one and Stoke clear. Off we go then! Stoke get things under way. The players stroll out on to the pitch at Emirates Stadium with lovely blue skies above. Arsene Wenger seeks out Mark Hughes to shake his hand and we are a couple of minutes away from kick off. "To score goals you have to create chances and sides always sit in when they visit the Emirates. Arsenal have just not been incisive enough so far this season." Arsenal average a league-high 65% ball possession this season, but it comes with a catch - the Gunners have the second lowest shot conversion percentage in the Premier League. Will they develop the cutting edge today that they have been missing so far this season? We feel we are better equipped to deal with Arsenal on the road now. We have players who can cause them problems. They have struggled at home, surprisingly, and maybe on the back of a break, going there this weekend could be a good time to go. Maybe teams used to fear going to the big clubs but that isn't the case any more. They travel with the intention of causing problems. Stoke have been here a long time in the Premier League and they have improved their technical quality. They have always had good teams and overall when we go to Stoke they are always specially motivated against us. There is a little bit of history because of what happened and overall it was always very difficult for us. For me there was never bad blood, it was just a game that was always very difficult for us. Arsenal fans may not be best pleased with how things are going so far but it could be worse. Chelsea, the defending Premier League champions, have just lost 3-1 to Everton. If results go against them, the Blues could be in the relegation zone on Monday. Arsene Wenger has made a rather bold claim that Arsenal have enough firepower to fight for the title this season - challenging Theo Walcott, Olivier Giroud and Alexis Sanchez to score 20 goals each. Do you agree with Wenger, Arsenal fans? And Stoke supporters. Are you concerned with your side's start to the season? Or are you confident enough that performances suggest the results will come? Stoke are still without a Premier League win this season, which is a surprise, but do I really fancy them to go Arsenal and win? No, I don't. The Gunners have only picked up one point from their first two home games, but they were unlucky to have a perfectly legitimate goal ruled out in their draw with Liverpool and I think they will have something to celebrate at Emirates Stadium on Saturday. "It was 29 August 1981 when Stoke last won at Arsenal. "It was a month after Prince Charles married Princess Diana. Sebastian Coe and Steve Ovett had broken the world mile record three times in 10 days and Aneka's Japanese Boy knocked Shakin' Stevens' Green Door off number one in the charts. "With Charlie Adam and Ibrahim Afellay banned and Mame Diouf possibly injured, their hopes of causing Arsenal the sort of headaches they do at the Britannia Stadium don't look bright. "But Arsenal have found scoring at home problematic. Couple that with Stoke's durable away record of four draws in five and it could be a frustrating day for home fans." Just the one change for Arsenal as Mesut Ozil returns from injury and replaces Alex Oxlade-Chamberlain. Theo Walcott starts in attack for the second game in a row. Arsenal XI: Cech; Bellerin, Paulista, Koscielny, Monreal; Coquelin, Cazorla; Ramsey, Ozil, Sanchez; Walcott. Subs: Ospina, Debuchy, Gibbs, Arteta, Oxlade-Chamberlain, Campbell, Giroud. Stoke boss Mark Hughes makes three changes with the injured Glen Johnson missing out and Charlie Adam and Ibrahim Afellay suspended. Phil Bardsley, Joselu and Marko Arnautovic come into the side. Striker Jon Walters misses out with a knee injury. Stoke XI: Butland; Bardsley, Cameron, Muniesa, Pieters; Whelan, van Ginkel; Diouf, Shaqiri, Arnautovic; Joselu. Subs: Given, Wollscheid, Wilson, Ireland, Sidwell, Bojan, Crouch. Arsenal fans have enjoyed a strong start to the season in our new Predictor game - they are fifth in the leaderboard when it comes to guessing the outcome of Premier League fixtures. Stoke's supporters haven't fared quite so well - they're in 16th. You can help your team move up the leaderboard by predicting the outcome of this match and the rest of the weekend's top-flight fixtures here. Hello! Welcome to our live text commentary on Arsenal versus Stoke. Don't want to miss a thing from this fixture? Then stay right here. Also worth opening another window in your browser for our Saturday football live text page for all the scores from everywhere else. After drawing blanks in their two home games so far this season, can the Gunners get at least a goal, and a win, today? Stoke to stand and deliver? 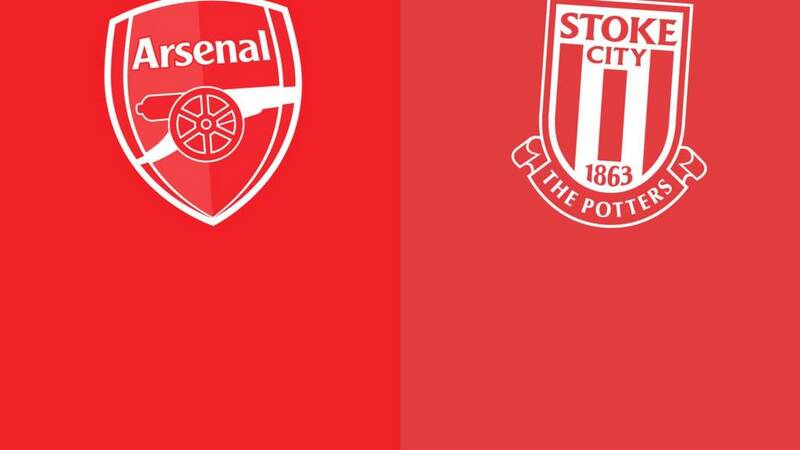 For 34 years, the visit of Stoke has been a welcome fixture for Arsenal. Not since 1981 have the Potters managed to a record a win at the Gunners - a year when the first London marathon was held, a Ricky Villa wonder goal won the FA Cup for Tottenham against Manchester City and Adam and the Ants were riding high in the charts. Since, then Arsenal have won all 13 meetings with Stoke on home soil. Will the visitors 'stand and deliver' the three points to the hosts once again? all of today's other games here.